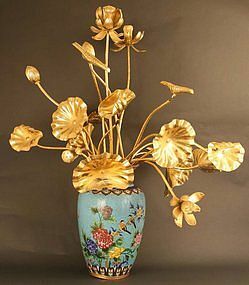 Japanese Gold Lacquered Lotus Flowers, early 19th C.
A Superb, Rare Pristine 18th Century Japanese Noh Theater Mask of Ko-jo, an elegant old man in Noh Drama. This mask is of the highest quality carved to dramatic perfection. Finely lacquered over wood. A magnificent addition for the serious Noh mask collection. 8 inches (20.5 cm) height x 5.5 inches width. Height with beard is 14.5 inches (37 cm). From a prominent and widely exhibited collection. Antique Japanese Okimono Bamboo Sculpture of a Snow Monkey Holding a Peach. Unique master carving of wonderful charm and presence with a fine patina. A must for the monkey and Japanese enthusiast. 12 inches, 30.5 cm tall. Excellent Condition. From a prominent and widely exhibited collection. Fine example of a Jomon Period Dogu, the earliest known Japanese figure. 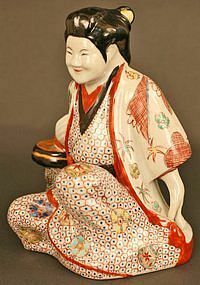 This figure was purchased in Japan and belonged to the renowned Japanese art historian, Shirley Day. The Dogu acted as effigies of people. They manifested some kind of sympathetic magic. 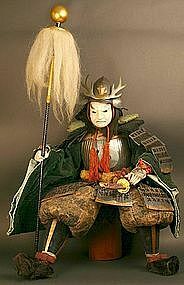 For example, it may have been believed that illnesses could be transferred into the Dogu, then destroyed, clearing the illness, or any other misfortune. 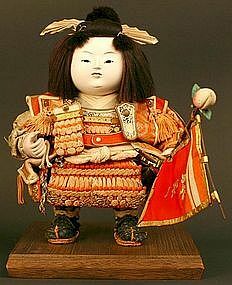 Because of the ritual destruction of Dogu, they are quite rare. 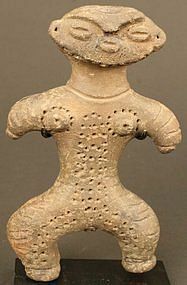 This primitive abstract fertility figure has a futuristic look. 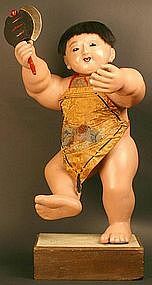 There are fun theories that state that the Dogu may be linked to extra-terrestrial Ancient Astronauts. The figures resemble 'space suits' complete with rivets and a helmet/face mask and goggles. The large eyes are also reminiscent of the traditional grey alien. 5.5 inches, 14 cm tall. Japanese Bronze Sculpture of a Mermaid in a Whirlpool. 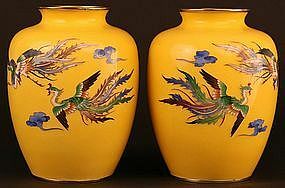 An exquisite example by the important artist Isihara of the type of Japanese art that was having a major influence on Art Nouveau. A rare example of this artist's work. 9.5 inches (24 cm) long. Excellent Condition. From a prominent and widely exhibited collection. 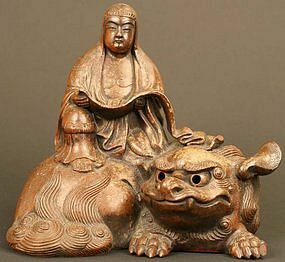 17th Century Japanese Standing Buddha. 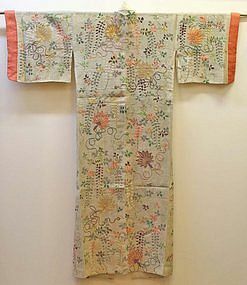 A rare and fine example from the early Edo Period. Carved of Poloma wood with a rich dark patina. Complete with Stand and Mandala. It has a spiritual presence and a beautiful face to contemplate. 15 inches, 38 cm tall. From a prominent and widely exhibited collection. Pair of Exquisite Gilded 18th Century Japanese Angels Wood Sculpture. One angel has her scarf unfurled and caught in a tree. The other is up in the clouds in heaven. Legend has it the angel’s scarf is caught in a tree and did not allow her to heaven. A young man passing heard her and fell in love with her, but was distraught at her sadness and released her scarf so that she could fly back to heaven. Angel with scarf: 5 inches (13cm) long, Angel on clouds: 6 3/4 inches (17cm) long, height of both angels is 4.5 inches. Fine Condition. From a prominent and widely exhibited collection.